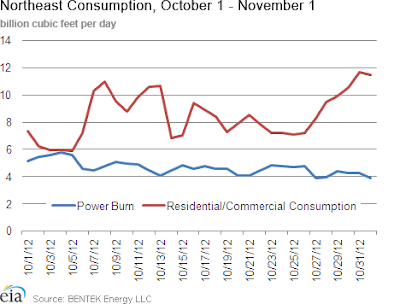 "In the Northeast, natural gas power burn generally fell over the past few days, possibly as a result of reduced demand for electricity, according to data from BENTEK Energy LLC (Bentek). Estimates for natural gas consumed for power generation were 3.9 billion cubic feet (Bcf) today, compared to 4.4 Bcf on Monday. Any declines in natural gas-fired generation because of electric power demand destruction may be somewhat mitigated by power producers substituting natural gas for lost nuclear capacity resulting from the storm. According to the situation report, three nuclear reactors remained offline as of this morning, and two units that had been operating at reduced capacity had been restored to close to full capacity. Bottom line: natural gas consumption for power has not decreased as much as expected because of nuclear outages and consumption in residential and commercial is up because of the cold weather. It looks like gas use might actually increase, at least temporarily, as a result of Sandy. Not what I expected, but it's OK with me. If you are interested, make sure to check out the daily situation reports from the EIA. Here is one from today.